Here in the Northwest we often think of energy saving only in terms of winter heating costs. Keep heat out of the house to begin with. The hotter you make the house, the harder your cooling equipment has to work. Don’t add heat yourself. Skip using the oven; choose the BBQ or even a microwave instead. Avoid using the drying function on your dishwasher. 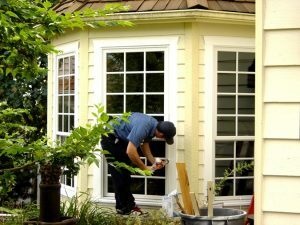 If you have aluminum windows or single paned windows, consider upgrading to insulated vinyl windows with Low E (energy efficient) glass. This will keep significant heat out of your home. Improve insulation in your attic. Having adequate attic insulation helps as much in keeping it cool in the summer as keeping heat in during winter. Pull down shades, close windows and blinds where the warmer afternoon sun comes in. Add shades or blinds to French doors or sliding glass doors. Open windows at night to let the house cool down as much as it can overnight. Ensure your cooling system is running at maximum efficiency by starting your AC early in the day. Don’t wait for heat to build up in the house. Like city vs highway mileage for your car, the mileage or in this case energy use is worse with stop and go airflow. Move air inside your house. Add a low cost ceiling or attic fan and make sure it’s installed correctly. See why below. Everyone can save by reducing use of higher cost electricity during the peak hot times of day. Turn off and/or unplug unused appliances, or use appliances at night when rates are lower. Service cooling equipment annually. 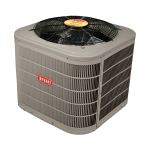 If you have a central heating & cooling system such as a heat pump, central air conditioning, or ductless heat pump, you’ve likely made an energy efficient cooling choice. Maintenance service is important, especially for air conditioning systems that may sit idle for much of the year. You want it to work when it gets hot. Just like maintenance on your car, it will prolong the life of your expensive equipment and ensure you are getting the right “gas mileage”, or energy efficiency out of it. You can benefit from adding ceiling fans to your house even if you have a cooling system. Just having air movement can help you feel 5 degrees cooler so you can use your cooling equipment less. Ceiling fans don’t actually lower the temperature in the room, they provide a breeze. To get the best from your ceiling fans make sure they are set up correctly. Make sure the blades are moving in the correct direction, rotating counter clockwise so you get a downdraft of air. They should have plenty of air circulation around them, and be positioned 7-9 feet off the floor. Don’t leave ceiling fans on when you aren’t home. They don’t cool the room, they just cool your skin with a breeze. So if they are running and you’re not there, they are just using electricity. An attic fan can actually pull hot air out of the top of your house and reduce heat in your home by up to 15 degrees. This solution is perfect for Northwest homes that tend to have more than one floor and heat that is trapped on the top floor or attic. A solar attic fan is a great option as it is completely solar powered. Even in the Northwest the solar attic fan can draw enough energy from it’s compact solar panels to enable it to do a great job cooling. Plus, these units are tough and rated to withstand hurricanes as they are popular in the Southern US. Attic fans and solar attic fans are widely available. We advise that you consult a professional about proper installation. For more information on Air Conditioning, AC service or energy efficient cooling products such as EnergyStar rated heat pumps, or solar attic fans, contact Washington Energy Services at 800 398 – 4663 or click our free estimate form on this email. You’ll be contacted within 24 hrs.